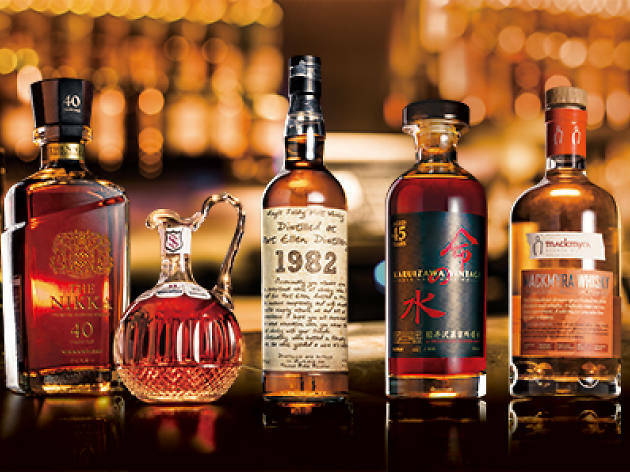 We find out about the rarest whiskies in Hong Kong, from left to right, and which bars to drink them at. These days, everyone's looking for the best cocktails in Hong Kong, the best bars for whisky, or even the best bars to eat and drink, but nothing is more satisfying than finding the rarest dram, no matter the ambience. Luckily, several of these places have both, but this time, we line up THE rarest, from left to right, and where to try them. It’s unusual to talk about active distilleries, rather than defunct ones, when talking about rare whisky. But bartender-in-chief Masahiko Endo of Mizunara recommends just such a tipple. The Nikka 40 is a blended whisky containing some of the oldest stock available at Nikka’s distilleries, including Yoichi malt distilled in 1945 and aged for a staggering 40 years. 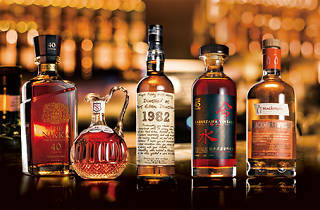 Visit Mizunara to get a taste of this rare dram, a mere $8,000 per glass. All we’re going to say is this is the last bottle of its kind anywhere in the world! This 33-year old Macallan highland single malt is now one of a kind, bottled in 1977 in an antique 19th century Saint-Louis Crystal decanter that’s stoppered with a silver seal. Even if you can’t afford the $70,000 price tag, it’s worth venturing to Stockton just to catch a glimpse of this marvel. And for collectors who want this as part of their library, just keep in mind to savour every drop as if it’s your last – because it is! Safe is the only distributor of Scotch Malt Whisky Society bottles in Hong Kong, so you can expect the rarest whiskies by renowned and closed distilleries from all around the world. There’re over 700 bottles behind Safe’s secure metal doors and many that are collectors items. A prime example is the Port Ellen 1982 28-year-old, with a handwritten label, that’s going for a cool $1,030 a glass. Closed in 1983, the 1982 is considered the swan song of the famous Islay distillery. You know a place is serious about its whisky when the restaurant imports its water from Kagoshima, Japan, just for the ice. You want that kind of finesse if you’re sipping down Karuizawa’s Aqua for Life. The distillery has been defunct since 2001, so there are a finite number of casks remaining. This rare bottle was distilled in 1967, bottled 45 years later in 2012, and the Karuizawa name alone is guaranteed to bring a twinkle to any enthusiast’s eye. Sold by the bottle for $88,000. Apart from flat pack furniture, Sweden is also home to clean waters, bumper barley crops and cool, dry weather – exactly the elements a good whisky needs. All ingredients used in the production of the Mackmyra whisky are sourced within a 75-mile radius of the town, making it a true representation of its home region. Whisky@Stables houses a ‘living cask edition’ ($108) where an oak cask on premise, right here in Hong Kong, continues the maturation process, adding hints of raisins, chocolate and spice to its flavour profile.